An event production cue sheet is a document that states the sequence of technical cues for a particular show (concert, session, broadcast, etc) in a way that the technical (AV) and creative teams can understand easily. 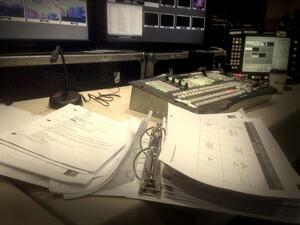 The production cue sheet is also called the rundown, show flow, cue2cue, q2q, run sheet and even script. How is a production cue sheet laid out? 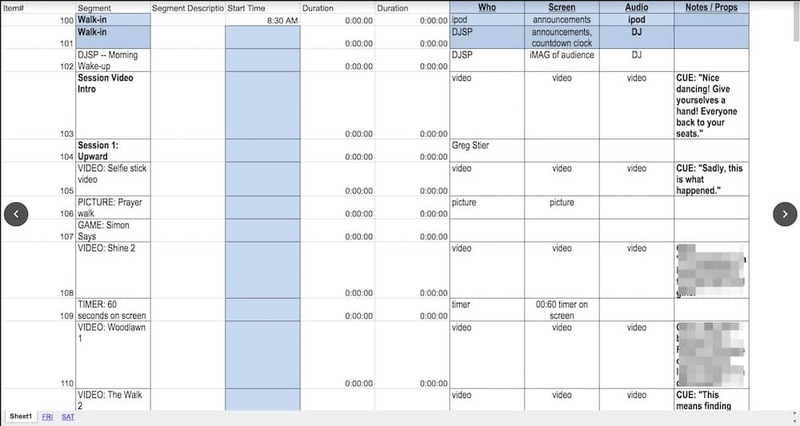 Cue sheets are typically laid in out a grid format, where the first column is the list of key events in a show (presenter walks on stage, presenter plays video, etc) and the remaining columns represent the various technical departments cues for that event (audio, video, lights). Cue sheets are typically created by the production team in excel, printed and then distributed out to greater production crew for rehearsals and show. Event production cue sheets are always given a version number because changes are expected in production and the crew will often need to reference which version of the cue sheet they are working off of. Who creates the production cue sheet / rundown? Cue sheets are typically created by the production team in excel, printed and then distributed out to greater production crew for rehearsals and show. Event production cue sheets are always given a version number because changes are expected in production and the crew will often need to reference which version of the cue sheet they are working off of. The production cue sheet is also called the rundown, show flow, cue2cue, q2q, run sheet and even script. Who manages the production cue sheet / rundown? The production cue sheet is typically managed by the event show caller for events and the director for broadcast and television. The show caller will often receive a high level agenda from either the end client or producer and they will then transpose that into an excel document into the traditional cue sheet layout. When do I print / email a version out to my crew? Staging Meeting - When your full technical crew gets together to run through the show on paper for the first time. After rehearsals, before final cue2cue - when a majority of the changes and updates have been identified. What is an example template of a cue sheet / rundown? There are different styles of cue sheets depending on the type of production you are running, but most follow a similar format of item rows with technical and creative columns across the right. Here are some examples from the live event production industry. 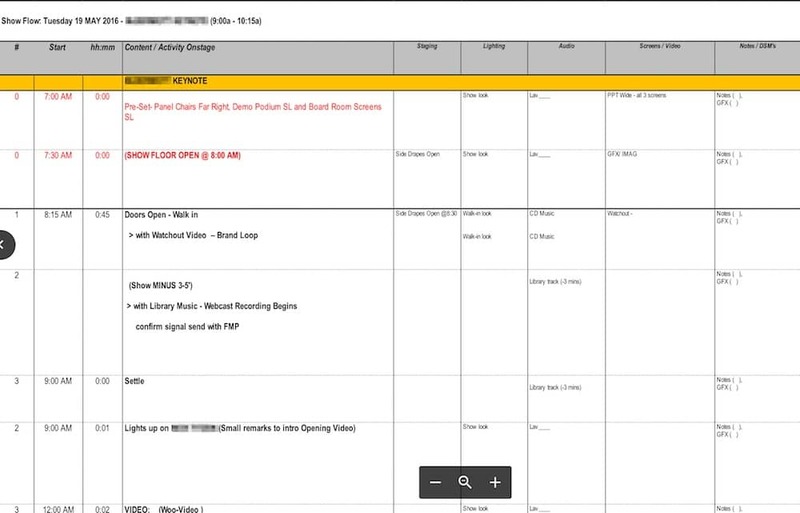 Is there an app or software for building production cue sheets / rundowns? Smart Sheets - A google sheets competitor, again targeted at general real-time spreadsheet collaboration. Not as widely known or accepted as google. 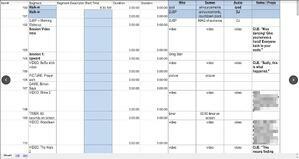 Google Sheets - Great for collaborating but still a blank grid so you have start from scratch. You can invite people to view but editing permissions can be scary. Shoflo - Event production software targeted specifically at the collaborative, realtime building of cue sheets and rundowns. Benefits include industry specific features like show caller tracking, timers and cue sheet templates. Where can I speak to someone about how to build rundowns?